So, I had no idea that flat irons came that small, but, they do! This Flat Iron is actually shorter then a pencil; yes a pencil! Why so small? 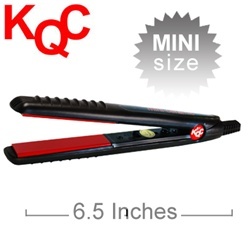 Because this is a flat iron that is used for traveling! It takes up almost no room in your bag, so it is perfect to take anywhere! I have to say, after seeing the size I had to question it a little, I thought, how long will this take? Surprisingly it didn't take that long to do the job. My hair isn't super curly, or really curly at all, it just has a natural wave so it never takes me too long, I'd say with the smaller flat iron it took me about an extra 5-10 minutes to get my hair the way I wanted, which really isn't all that long. I seriously could only have about 1 purse full of stuff with me, and this little flat iron was perfect! If I would have brought my old Flat Iron then I would have been able to bring even less with me.. So I was very very happy I had the KQC Mini! In addition to the FIE Holder I also received the FIE Heat Resistant Bag. 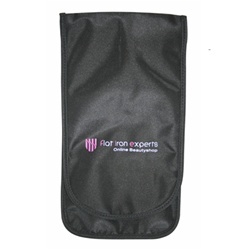 The heat resistant bag is really a must have, it helps to keep you safe by preventing melting or accidental burning. Safety First! 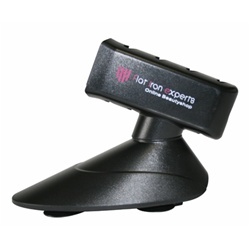 Overall I was very impressed with The Flat Iron Experts, my item is perfect and I love it! Disclosure: Review product(s) was provided to me free of charge. All opinions expressed are my own and were not influenced in any way. There was no monetary compensation received.